Dioscorus of Alexandria was the twenty-fifth bishop of Alexandria, known in Oriental Orthodox tradition as Pope St. Dioscorus the Great. In Catholic and Eastern Orthodox history, however, he is considered to be one of the main instigators of the heresy known as Monophysitism. He reigned from 444–451 C.E., after which he was deposed at the Council of Chalcedon. A disciple of Saint Cyril of Alexandria, whom he succeeded as patriarch, Dioscorus was an outspoken opponent of Nestorianism and proponent of the view that Christ's humanity and divinity must be regarded as united in "one nature." He supported the cause of the monk Eutyches, who had been condemned at Constantinople for his Monophysite views, and engineered his restoration at the Second Council of Ephesus in 449. However, Dioscorus' fairness in handling this council came under severe criticism after he refused to allow a letter of Pope Leo I to be read to the bishops at Ephesus and engaged in heavy-handed tactics against Eutyches' opponents, leading to an outbreak of violence and ultimately a schism with Rome. The death of Emperor Theodosius II led to the calling of the Council of Chalcedon in 451, which deposed Dioscorus and promulgated the Chalcedonian Creed, in which the concept of Christ's "two natures" became the official doctrine of Catholicism and Eastern Orthodoxy. Dioscorus died in exile on September 17, 454. After 1500 years of schism, recent decades have witnessed a reconciliation between Oriental Orthodox and Chalcedonian Christians, although the latter still do not accept Dioscorus as a saint. Before becoming patriarch (also known as pope in Alexandrian tradition) Dioscorus served as the dean of Alexandria's catechetical school and was the personal secretary of Patriarch Cyril of Alexandria. He accompanied Cyril to the Third Ecumenical Council, held at Ephesus in 431, where Cyril presided in the condemnation of Nestorius. He later held the position of archdeacon of the Alexandrian church. In his opposition to the teaching of Nestorius, Cyril explained the union of Christ's divinity and humanity as "inward and real without any division, change, or confusion." He rejected the Antiochene theory of "indwelling" or "close participation" as insufficient, charging that this theory permitted the division of Christ's being, similar to the supposed error of Nestorius. Dioscorus followed Cyril in teaching "one incarnate nature" of Christ, expressed in Greek as "miaphysis," though not "monophysis." The term mia is distinguished from mono in the connotation of a united being, as opposed to a solitary being, thus emphasizing that after the Incarnation, the divine and human natures were completely united in Christ. The Antiochene formula, on the other hand, held to "two natures after the union," although eventually admitting that these two natures must not be seen as separate from one another. Despite these underlying differences between the Alexandrian and Atiochene schools, after the Council of Ephesus, Cyril and made peace with important former supporters of Nestorius. 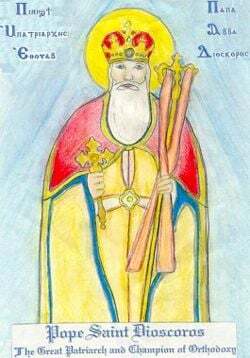 Amicable relations seem to have continued between the Antiochene and Alexandrian factions for several years after Cyril's death until 448, when Bishop Ibas of Edessa was accused of heresy and other crimes by the Alexandrian party, but was acquitted by Bishop Domnus of Antioch. Acrimony continued to build during a struggle between Eutyches, an influential archmandrite of a monastery near Constantinople, and the respected Syrian scholar and Bishop Theodoret of Cyrrhus. Eutyches not only defended the idea of "one nature" in Christ but seemed to conclude that, as a result of his divinity, Christ's humanity was substantially different from that of other men. Theodoret accused both Eutyches and Cyril of what later became known as the Monophysite heresy, which allegedly failed to acknowledge that Jesus was truly human. A council held at Constantinople in 448 condemned Eutyches and removed him from his monastic post. Pope Leo I, who had earlier written to Eutyches praising his zeal in opposing the Nestorianism, now sent his famous Tome (letter) supporting the idea of "two natures" and calling on Eutyches to repent. Dioscorus, however, intervened on Eutyches' behalf, and Emperor Theodosius II then convened the Second Council of Ephesus in 449. The emperor invited Dioscorus to preside at the conference, urging him to do so in a spirit of strict impartiality. Dioscorus' handling of the council, however, became a source of great controversy, and the council has come to be known to history as the "Robber Synod." Not only did Dioscorus bring a very large delegation of African bishops loyal to himself, but he began the meeting without the presence of John of Antioch and his contingent of Syrian bishops. To make matters worse, Dioscorus refused to allow the reading of a letter from the Leo I expressing his view on the theological issue. Eutyches was rehabilitated, while his accusers at Constantinople were deposed. Archbishop Flavian of Constantinople was allegedly beaten by Eutyches' supporters and soon died in exile, perhaps as a result of his wounds. Eutyches was reinstated as head of his monastery, while Dioscorus influenced the emperor to accept his protege, Anatolius, as the new patriarch of Constantinople. Reports reaching Rome, notably that of the deacon and future pope Hilarius, characterized Dioscorus' behavior in a most negative light. Mutual excommunications between the bishops of Rome and Alexandria soon followed. Thus was born the Monophysite schism that would plague the empire for decades. After Emperor Theodosius II died on July 28, 450, he was succeeded by the military leader Marcian, who desired reconciliation with Rome. Turning the tables on Dioscorus, he placed the papal legate Paschasinus in charge of the new Council of Chalcedon, with the close advice of imperial commissioners. Dioscorus defended his view that the council should adopt the formula "one incarnate nature of God the Word," meaning that, after his birth on earth, Jesus had a single divine-human nature, not two natures. Since Eutyches also taught this but was also accused of teaching that Christ's humanity had been subsumed by his divinity, Dioscorus insisted, as Cyril had: "We do not speak of confusion, neither of division, nor of change." Dioscorus had expected about 60 bishops to support him, but, in the presence of the emperor's agents, none was willing to speak in his defense, including his former secretary Anatolius. The verdict was announced: Dioscorus was deposed, as were Juvenal of Jerusalem, Thalassius of Caesarea, Eusebius of Ancyra, Eutathius of Berytus, and Basil of Seleucia, all of whom had been leaders supporting Dioscorus at the Second Council of Ephesus. Dioscorus was exiled to Gangra, now known as Cankiri, Turkey. The Council of Chalcedon elected the Alexandrian priest Proterius the new patriarch to replace Dioscorus, with the approval of the emperor. The elevation of Proterius to the patriarchate was violently opposed by Dioscorus' supporters, and his accession marks the beginning of the schism of 451 between the Coptic and the Orthodox patriarchs of Alexandria, which has never been completely resolved. Dioscorus, meanwhile, parted ways with Eutyches, declaring Eutyches' views to be indeed heretical, while still refusing to accept the Chalcedonian formula of "two natures." In 454, Dioscorus died in exile, three years after Chalcedon. In Alexandria, his supporters now elected Timothy, Dioscorus' disciple, to be their new patriarch. Proterius, who was seen by the Copts as a usurper and imperial henchman, was murdered by an angry mob shortly before Timothy became Coptic pope. A shrine in Dioscorus' honor is located at Saint Mark's Cathedral in Cairo. 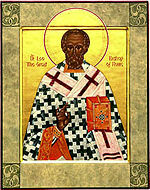 Dioscorus is considered a saint and an orthodox confessor by the Coptic, Syriac, and other Oriental Orthodox Churches. In Catholic and Eastern Orthodox tradition, on the other hand, he has been seen as a leading Monophysite heretic and schismatic. In recent years significant progress has been made toward achieving a reconciliation between Chalcedonian and Oriental Orthodox traditions, while stopping short of reaching full communion. In May 1973, after 15 centuries of separation, Coptic Pope Shenouda III visited Pope Paul VI of Rome and declared their common faith in Christ. A similar declaration was reached between the Oriental Orthodox Churches and the Eastern Orthodox Churches in the 1990 in Geneva, in which both the Eutychian and Nestorian heresies were condemned. In the summer of 2001, the Coptic Orthodox and Greek Orthodox patriarchates of Alexandria agreed to recognize the validity of the baptisms and marriages performed in each other's churches. ↑ Coptic.net, Coptic. net Monophysitism Reconsidered. Retrieved February 21, 2009. 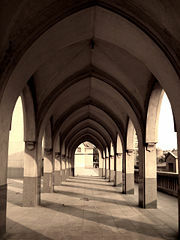 ↑ Coptic.net, Meeting between Oriental and Byzantine Orthodox Churches. Retrieved February 21, 2009. ↑ Orthodox Unity, Orthodox Unity. Retrieved February 21, 2009. 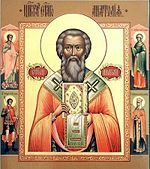 ↑ Orthodox Wiki, OrthodoxWiki Article on Chalcedon. Retrieved February 21, 2009. Davis, Stephen J. Coptic Christology in Practice: Incarnation and Divine Participation in Late Antique and Medieval Egypt. Oxford early Christian studies. Oxford: Oxford University Press, 2008. ISBN 9780199258628. McGuckin, John Anthony, and Cyril. St. Cyril of Alexandria: The Christological Controversy: Its History, Theology, and Texts. Supplements to Vigiliae Christianae, v. 23. Leiden: E.J. Brill, 1994. ISBN 9789004099906. Price Richard, and Mary Whitby. Chalcedon in Context Church Councils 400-700. Liverpool Univ Pr, 2009. ISBN 9781846311772. Young, Frances M. From Nicaea to Chalcedon: A Guide to the Literature and Its Background. Philadelphia: Fortress Press, 1983. ISBN 9780800607111. History of "Pope Dioscorus I of Alexandria"
This page was last modified on 31 March 2019, at 22:48.